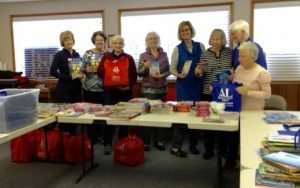 Books for Kids started as an Outreach program and has been a stand alone program for three years. The committee has donated books and activity materials for over 600 children ages 3-12 to Department of Human Services TANF family coaches for the families to encourage literacy. The Eugene Mission is an additional agency being served through donation of books and activity materials to the newly renovated Moms and Kids playroom bookshelf. The need is great and much appreciated by counselors and families.